Beta Klinik features a multi-spiral CT. The advantage of this particular CT is a combination of pace, high-definition image quality and reduced radiation. These key aspects make it first choice for clinical examinations and research. Since patients vary in terms of height, weight and anatomy, the radiation exposure is adapted to each individual in order to save radiation up to 68%. 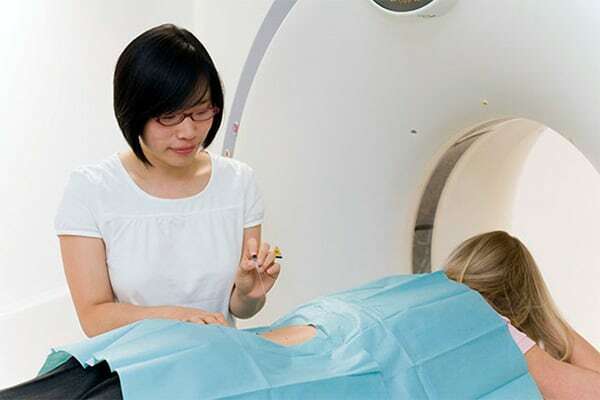 Since our CT employs the multislice spiral technique, X-ray tubes and detectors rotate around the body in a fast pace enabling comprehensive examination in short time. This short examination time is especially suitable to elderly patients and patients who are only able to lay down very shortly. Even examinations making breath control necessary are feasible and bearable not only for patients with a short breathe. Additionally, image artifacts are reduced, which is very important for heart examinations. How does computed tomography work? Computed tomography bases on X-ray technology. However, during CT examination X-ray pictures are taken from different directions. Thanks to multislice spiral CT technology, an X-ray tube and detectors rotate around the person and record up to 64 layers at the same time at high speed. High-performance computers create anatomical images from these data sets. 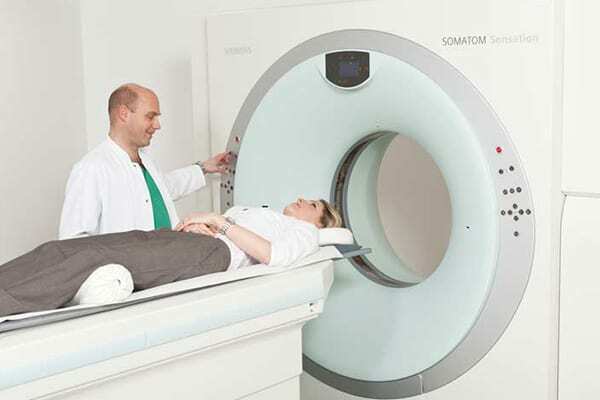 The CT of Beta Klinik adapts the radiation dose automatically in real time during a CT examination. This makes the best radiation dose for every individual patient possible. In some cases, it can be necessary to use a contrast agent in order to make specific characteristics of a certain tissue visible that would not be visible without it. Depending on the region to be examined, this contrast agent has to be taken orally, intravenously or intra-thecally (in the dural sac/spinal canal, e.g. in case of conventional myelography or CT myelography). If you have to take it orally, for example, you drink a certain amount of contrast agent before the examination. Because CT contrast agents contain iodine, the intravenous application can cause an (pseudo-)allergic reaction. Therefore it is important to answer a few questions before the examination, also to figure out if you are allergic to iodine.